Jon Dette will fill in for drummer Charlie Benante on the first few weeks of ANTHRAX's 29-city European tour that kicked off May 27, in Barcelona, Spain and runs until July 12 in Balingen, Germany. Benante, who had surgery on his hand last summer and has been going for regular physical therapy up until just recently, thought he'd be back to 100% for the Carolina Rebellion and Beale Street Music Festival shows that ANTHRAX also did earlier this month. "Playing those shows, I realized I'm just not quite there yet," Charlie said, "especially for the schedule ANTHRAX has on these European dates. I'm hoping to join the tour for the last couple of weeks, but until then, we all appreciate that Jon can sit in for me." Benante plans to be drumming on ANTHRAX's handful of North American dates later this summer that include Heavy MTL in Montreal and the MOTÖRHEAD MotörBoat cruise, set for late September with MOTÖRHEAD, MEGADETH, Zakk Wylde and others. Following these dates, ANTHRAX will enter the studio to write and record their follow up to 2011's Grammy-nominated "Worship Music", named "Metal Album Of The Year" by fans and in media outlets across the globe. Dette previously filled in for Benante during ANTHRAX's appearance at the Soundwave festival in 2013. 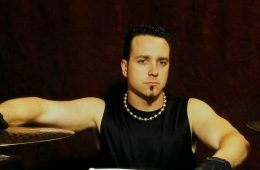 Jon told "The Blairing Out With Eric Blair Show" how he initially got the call to step in for Charlie: "Actually, Jason Bittner from SHADOWS FALL, who was filling in for Charlie on [the 2012] ANTHRAX run, couldn't do one of the tours that was coming up and called me and asked me if I would be available to do it. And I said, 'Of course. It would be great.' And the next day Charlie called me — which, Charlie is one my biggest influences ever, next to [Dave] Lombardo [of SLAYER], so it was kind of a surreal moment for me to get a call like that, saying, 'Hey, can you help me out?' Which, of course, I said, 'Absolutely.'" Asked how it felt to be playing with ANTHRAX, Dette said: "It's amazing, man. The first day that I started playing drums — a lot of people may or may not know this — the first album I ever got from the day I got my drum set was 'Fistful Of Metal' [by ANTHRAX], and literally, the first song I ever tried playing on drums was 'Metal Thrashing Mad'. Actually, I [was] hanging out with Charlie and I told him that this morning, and he was, like, 'Really?' And I'm, like, 'Yeah, really.' [laughs] ANTHRAX, METALLICA and SLAYER, they were such a foundation of my style growing up, and I've been privileged now to actually play for two of those bands [ANTHRAX and SLAYER]. It's a very natural thing for me to play, but at the same time, seeing the back of their heads on stage, and Joey [Belladonna] is looking at me and he's singing, and I'm just, like, 'This is great.' I guess you can say that I play with a lot of passion when I'm with those bands, 'cause it's just absolutely passion and just an amazing experience." For the remainder of ICED EARTH's European tour with VOLBEAT, Jon Dette (SLAYER,TESTAMENT, ANTHRAX) will sit behind the drums, taking over for Raphael Saini, who filled in during the summer festivals, the recording of ICED EARTH's new album, and the club leg of theVOLBEAT tour. "Raphael came in and helped us out of a tight spot this summer with a full schedule of festivals, a new album to finish, and no room for diversion on the schedule," said ICED EARTHin a statement. "He came in and delivered and we are very grateful for that. We wish him all the best for his future endeavours." Added Raphael: "When I had the chance to join ICED EARTH for their summer festivals and the new album, I couldn't say no: I was really excited even though I knew that it was going to be something temporary. "I am honored to be part of the band's history, an amazing album, and to have worked with some supremely talented musicians. My journey will continue, there's more to come." 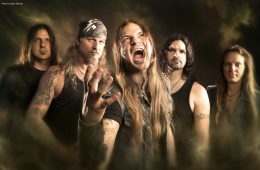 ICED EARTH earlier in the year parted ways with drummer Brent Smedley for "personal family reasons." The second leg of ICED EARTH's tour with VOLBEAT kicks off at O2 World in Berlin, Germany, tomorrow, November 6, and wraps at Forum, Copenhagen, Denmark on December 1. ICED EARTH will release its new album, "Plagues Of Babylon", in January 2014 via Century Media Records. The cover artwork was created and illustrated by Eliran Kantor(TESTAMENT, ATHEIST, SIGH, ANACRUSIS, GWAR). 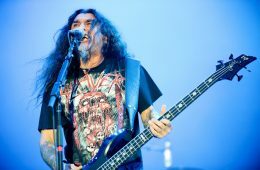 Fan-filmed video footage of ANTHRAX's July 28 performance at Gagarin 205 in Athens, Greece can be seen below. 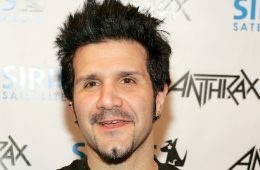 ANTHRAX's current touring lineup includes SHADOWS FALL guitarist Jon Donais, who has been touring with ANTHRAX since Rob Caggiano's departure in January, and former TESTAMENT/SLAYER and currentANIMETAL USA drummer Jon Dette, who is filling in for Charlie Benantewhile Charlie is "dealing with personal issues." Dette previously filled in for Benante on ANTHRAX's European tour last fall as the support act for MOTÖRHEAD and Australia's Soundwave Festival in February/March. Asked how he landed the ANTHRAX gig, Dette told "The Blairing Out With Eric Blair Show": "Actually, Jason Bittner from SHADOWS FALL, who was filling in for Charlie on this last ANTHRAX run last year, couldn't do one of the tours that was coming up and called me and asked me if I would be available to do it. And I said, 'Of course. It would be great.' And the next day Charlie called me — which, Charlie is one my biggest influences ever, next to [Dave] Lombardo [of SLAYER], so it was kind of a surreal moment for me to get a call like that, saying, 'Hey, can you help me out?' Which, of course, I said, 'Absolutely"
Raquel Figlo of Heavy Metal Hill conducted an interview with drummerJon Dette (TESTAMENT, SLAYER, ANTHRAX, ANIMETAL USA) at Thomas Lang's Big Drum Bonanza, which was held July 3-7 at Drum Channel Studios in Oxnard, California. You can now watch the chat below. On doing double duty with SLAYER and ANTHRAX during this year's Soundwave festival in Australia: Dette: "Well, I had just gotten off tour [with ANTHRAX] before [the Soundwave] tour started, so I really familiar with… I had already been into their music, and just knowing it for so many years. And the same with the SLAYER thing. I had three days to rehearse with them before going to Australia to do that tour. But I had known the songs for years, and [since] I [previously] played with SLAYER back in the '90s, I was very familiar with playing those songs. And when I listened to them again, it was like riding a bike; it was like I'd never forgotten [how to play it]. Again, it just falls back to the fact that I'm such a fan that I listened to their music not just to try to learn the drumming; it was part of my daily [routine]… When I was listening to metal [most of the time], not even daily, but every hour; it was, like, non-stop. And those were the bands that I listened to:METALLICA, ANTHRAX, SLAYER, MEGADETH, TESTAMENT… So it's definitely helped as far as memory retention in learning the songs."